Team HRC’s Gautier Paulin and Evgeny Bobryshev finished the 2015 MXGP season in the USA today placed second and third respectively in the World Championship. Aboard the factory Honda CRF450RW, Paulin won five motos and Bobby won a further two qualifying races this season, and the duo shared a total of nine Grand Prix podiums. Sealing second and third in the world, it is just the second year that the team has been a fully-fledged factory HRC effort, and coupled with a World Championship title in European MX250 and the MX2 World title on the works CRF250RW, it’s been a strong year for Honda. At the finale in Glen Helen this weekend, a pair of 8th place finishes for Paulin put him 7th overall in the MXGP of the USA, just behind Bobby who was sixth overall with a ninth and a fifth, having been running as high as second in race two. “I feel great after this season. I put my goal in front of me before this season and I followed this goal and now we have achieved it. It was really important for me to stay healthy; this was the main goal. Now we have third place so it’s really great.“If you take Russian legends like Kavinov, 36 years ago he was in third place, so now after such a long time I have ended this gap and done the same. There are many people in Russia who know the history and really follow this sport, and they’re really happy that a Russian has done this again. Tim Gajser – 2015 MX2 World Champion! 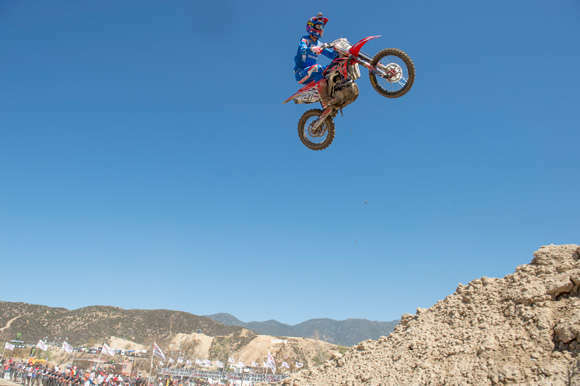 Nineteen-year-old Tim Gajser took an historic MX2 World Championship title today for the Honda Gariboldi Racing Team. It’s been a triumphant and meteoric year for Gajser and Honda Gariboldi Racing. In Arco di Trento in April he scored his career first MX2 Grand Prix victory on the CRF250RW. Since, four more victories have followed, including a further three trips to the podium. With three stellar performances on the sand tracks of Belgium, Italy and the Netherlands he took the lead of the MX2 World Championship, and with a faultless ride here in America clinched this historic title. It’s the first 250cc world title for Honda since Fred Bolley in 2000, and the first small-class crown for the Japanese marque since Alessandro Puzar in 1995. It’s also the first World Championship for the Honda Gariboldi Racing team, and Gajser becomes the first Slovenian to win the MX2 title. For team partner SHIFT, it’s also the first championship victory since Jeff Emig’s supercross title in 1997. With a contract with HRC until at least the 2020 season, Gajser has already added a significant chapter to the history of Honda and HRC in the Motocross World Championship.